What’s that? You can’t read German tweets? All you really need to get out of that is the “Milestone mitte/ende September” which simply means, middle to end of September for Android 2.2. This is fantastic news for Milestone owners who just a few weeks ago were told the decision had yet to be made by Motorola. 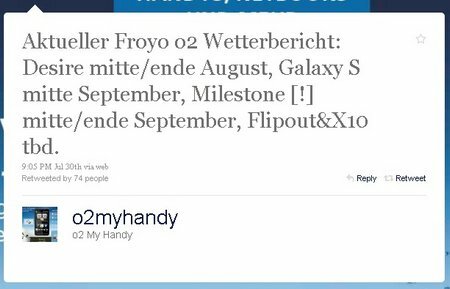 In case you were wondering, that Twitter account is the official German o2 account who should have a pretty good idea on software updates. On the flip-side, Motorola has yet to announce anything.